Reuters: Former US President Barack Obama assailed President Donald Trump and Republicans on Friday, urging Democrats to deliver a check on the administration’s “abuses of power” and restore a sense of sanity to politics by voting in November’s elections. In an unusually blistering attack on his successor, Obama said Americans were living in dangerous times and accused Republicans of threatening democracy, dividing the country, undermining global alliances and cosying up to Russia. Both parties are urging their core supporters to get to the polls for the 6 November midterm elections, when Democrats need to pick up 23 seats in the House of Representatives and two seats in the Senate to gain majorities in Congress and slam the brakes on Trump’s agenda. Obama, who had frustrated some Democrats by keeping a relatively low profile since leaving office in January 2017, accused Republicans of being unwilling to safeguard democracy or offer a check on Trump’s policies or worst instincts. He said voters would have to do it instead. Trump was dismissive of Obama’s speech. The November elections have been seen as a referendum on Trump, who has fulfilled campaign promises to cut taxes and regulations but who faces a widening special counsel probe of Russian interference in the 2016 presidential election and growing questions about his fitness for office, even by some within his administration. Obama ridiculed Trump for taking credit for economic gains that began under Obama’s administration, and said Trump was exploiting cultural fears and economic anger that have grown in recent years amid societal upheavals. 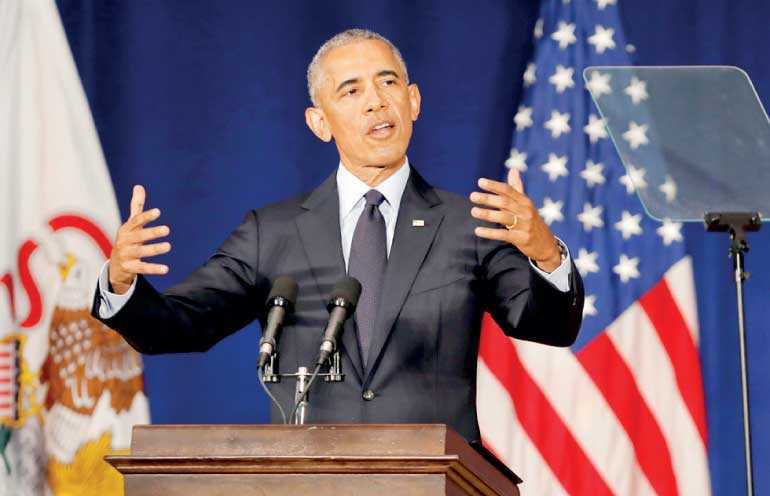 Until now, Obama had been reluctant to criticise his successor publicly, although last week he appeared to chide Trump, without naming him, in a eulogy for the late Republican Senator John McCain. But he dropped that political reticence in Illinois, the state where he launched his own political career, saying a vote against Republicans could restore “honesty and decency and lawfulness” to government. Republicans shrugged off Obama’s criticism. “In 2016, voters rejected President Obama’s policies and his dismissiveness towards half the country. Doubling down on that strategy won’t work in 2018 either,” said Republican National Committee spokesman Michael Ahrens. If Democrats win control of one or both chambers in Congress in November, they would be able not just to stymie Trump’s agenda but to launch investigations of the Trump administration. Trump told supporters in Montana on Thursday that Republicans needed to maintain control of Congress to stave off possible impeachment proceedings against him, although Democrats have played down any discussion of that approach. “If it (impeachment) does happen, it’s your fault, because you didn’t go out to vote. OK? You didn’t go out to vote. You didn’t go out to vote. That’s the only way it could happen,” Trump told the rally.